Howard Nemerov was the third Poet Laureate of the United States. At the time of this interview he was working on his 14th volume of poetry. He is the author of three novels, two collections of short stories and has received every top award including the Pulitzer in' 78. At the time of his death he was the Distinguished University Professor of English at Washington University in St. Louis. This interview took place the day of Mr. Nemerov's inauguration as Laureate. It was broadcast nationwide on satellite to public radio stations. I see you have a new manuscript in your hands. Do you like these new poems? Howard: I like all my children, even the squat and ugly ones. I am impressed because you always seem to remember all the poems you've ever written. Well, I remember that I've written them but I've never memorized many of them. This is the year of a presidential election so let's talk about whether history can tell us where we're going in our poetry. And can we read a poem and tell where we're headed? Can't be done. History is one of those marvelous and necessary illusions we have to deal with. It's one of the ways of dealing with our world with impossible generalities which we couldn't live without. And the fact that it's sequential, and chronicles things far different from the way the poet views the world. Yes, and a chronicle is very different from history proper. The historian is terribly responsible to what he can discern are the facts of the case but he's nothing if he doesn't make out a case. I sometimes talk about the making of a poem within the poem. When Robert Frost was alive I was known as the other new England poet which is to be barely known at all and after Robert and I became friends, and after he died, I wrote a poem about a couple of maple trees I'd walked under every Autumn. They come in the last line. And Robert had always said you mustn't think of the last line first or it's only a fake poem and not a real one and while I'm inclined to agree I make my own exceptions. I've thought of the last line of some poems for years and tried them out and it wouldn't work because the last line was much too beautiful for the poem and the poem never arrived at it properly but finally I think I got it in the poem FOR ROBERT FROST, IN THE AUTUMN, IN VERMONT "now on your turning page/ The lines blaze with a constant light, displayed/ As in the maple's cold and fiery shade." I'd be the last person to know or to be trusted on the answer. The two things have never been quite separable for me. I do insist on making what I hope is sense so there's always a coherent narrative or argument that the reader can follow instantly the first time through and then if there's something more to occupy the reader, I've been lucky. A lot. I'm sitting waiting with my hands out. I don't know what's taking them so long except for the unfortunate circumstances that there are other poets. Henry James advises the author to be generous and delicate and pursue the prize. He meant art. There are so many who are not generous or delicate but make up for it triply by pursuing the prizes. My poem FELLOWSHIP in WAR STORIES talks about this G: I've spoken to you about my startled discovery of your plays ENDOR and CAIN. I won't accept your talk of them being visited upon you and channeled through your arm. Playwrighting dramatic literature is a very different process from the charged writing of the poem. Tell me about that moment of inspiration. Let us take Cain. Had you been thinking about this for a long time. ENDOR was commissioned by the Union Theological Seminary in New York and I had that story about Saul in mind. The nice thing about the Bible is it doesn't give you too many facts. Two an a half lines and it tells you the whole story and that leaves you a great deal of freedom to elaborate on how it might have happened. You certainly got new psychological action from Cain and Abel and the mother. The characters were doing things that had not been covered before. They work out pretty good. Although a reputable actress said (of Cain) that I didn't understand people That these weren't real people. I said "Thank God For That!" When I was starting to write the great influence was T.S. Eliot and after that William Butler Yeats. I got, of course, the idea that what you were supposed to do was be plenty morbid and predict the end of civilization many times but civilization has ended so many times during my brief term on earth that I got a little bored with the theme and in old age I concluded that the model was really Mother Goose, and so you can see this in my new poems. Well as I say to my graduate students "It's my education. You're coming along for the ride." I still am. Somebody asked me 'Do you believe in God now' I said "No, but I talk to him much more than I used to." No I'm going to give presidents a bad name. These guys have been clanging each other for three months. Do we have to get all reverent suddenly? I am always interested in your sense of security about your ideas although you change them often. When I read your essays I am taken with the sound of self confidence. Where does that come from... a secure childhood? not looking back? That?s all a part of the game, isn't it. 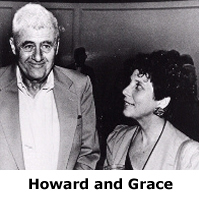 Howard Nemerov and Grace Cavalieri Howard Nemerov and Grace Cavalieri THE POET AND THE POEM Recorded at the Library of Congress with Howard Nemerov, the third Poet Laureate of the U.S. October 1988 A CONVERSATION WITH HOWARD NEMEROV Howard Nemerov (1920 - 1991) Grace Cavalieri: Howard Nemerov was the third Poet Laureate of the United States. At the time of this interview he was working on his 14th volume of poetry. He is the author of three novels, two collections of short stories and has received every top award including the Pulitzer in' 78. At the time of his death he was the Distinguished University Professor of English at Washington University in St. Louis. This interview took place the day of Mr. Nemerov's inauguration as Laureate. It was broadcast nationwide on satellite to public radio stations. Grace Cavalieri: I see you have a new manuscript in your hands. Do you like these new poems Howard Nemerov: I like all my children, even the squat and ugly ones. That?s all a part of the game, isn't it.